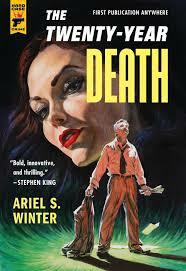 The Twenty-Year Death is Ariel S Winter’s debut novel…or three novels, depending on which way you look at it. The 670-page book from Hard Case Crime is made up of three separate stories, the first set in 1931, the second in 1941 and the finale…you got it…in 1951. The first story is set around the murder of a prisoner, set in France. Although meant to be incarcerated, the body of the victim was found blocking a drain outside a bakery in the nearest town to the high-security facility. So how did he get there, why had his clothes been changed and why is a notorious child torturer inside the prison, asking for an investigation? The second story jumps to the glamorous world of Hollywood. When an investigator is employed to keep an eye on a studio’s movie starlet. He’s told over and over that he’s simply been taken on to keep her happy and her paranoia under control. She’s convinced someone is following her but no one takes her seriously, especially due to her fragile nature. Soon another actress is dead and as the nervous starlet becomes a suspect, the investigator is fired and warned to stay away from the case. But what is the studio hiding? The Twenty-Year Death is a fabulous piece of pulp-style fiction that really nails some of the traditional tropes, while feeling fresh and intriguing. My favourite story was the first one due the darkness of the location, excellent imagery and the brooding crime noir feel. Each one of the stories is connected by a single character, I have tried my best not to give it away but it holds together three individual stories in an easy to follow style. These pulp style stories may not appeal to lovers of modern ‘gory’ crime but for anyone with a love for classic crime, this is an absolute must!